An in-depth examination of deterioration caused by fungi and other microorganisms, Wood Microbiology explores the major damages to wood and wood products during growth, harvesting, storage, and conversion to finished lumber. The characteristics, causes, detection, effects, and control measures for wood damage are stressed. 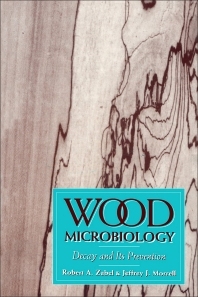 Introduction to Wood Microbiology. Wood Deterioration Agents. The Characteristics and Classification of Fungi and Bacteria. Factors Affecting the Growth and Survival of Fungi in Wood (Fungal Ecology). Fungal Metabolism in Relation to Wood Decay. The Decay Setting: Some Structural, Chemical, and Moisture Features of Wood in Relation to Decay Development. General Features, Recognition, and Anatomical Aspects of Wood Decay. Chemical Changes in Wood Caused by Decay Fungi. Ultrastructural Features of Wood Decay. Changes in the Strength and Physical Properties of Wood Caused by Decay Fungi. Colonization and Microbial Interactions in Wood Decay. Decays Originating in the Stems of Living Trees. Biodeterioration of Stored Wood and Its Control. Wood Stains and Discolorations. Decay Problems Associated with Some Major Uses of Wood Products. The Detection of Internal Decay. Paint Mildew and Related Degradative Problems. Natural Decay Resistance. Chemical Protection of Wood (Wood Preservation). Some Trendsin Wood Microbiology Research and a New Emphasis. All chapters contain summaries and detailed references. State University of New York, Syracuse, U.S.A.
Oregon State University, Corvalis, U.S.A.